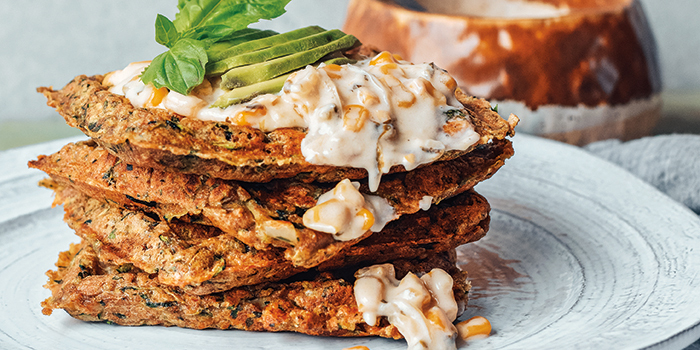 You’re sure to have a great day when you start it with savory Green Waffles with Creamy Corn Salsa from Mindful Vegan Meals by Maria Koutsogiannis! In my health coaching practice, I often see people who worry about macronutrients. There are those who are afraid of carbs and others who won’t even touch a health fat, such as an avocado. 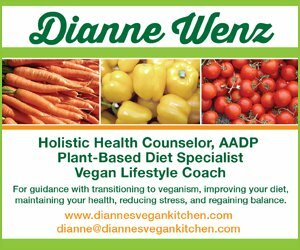 My philosophy is that if you eat a diet that’s full of a large variety of whole plant foods, you don’t need to worry about macronutrients, and I try to convey that ideology to my clients, too. 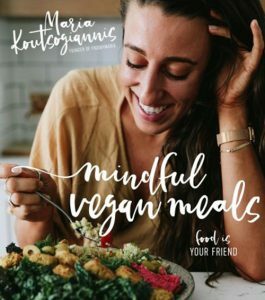 It’s also the school of thought behind Mindful Vegan Meals by Maria Koutsogiannis, as well. 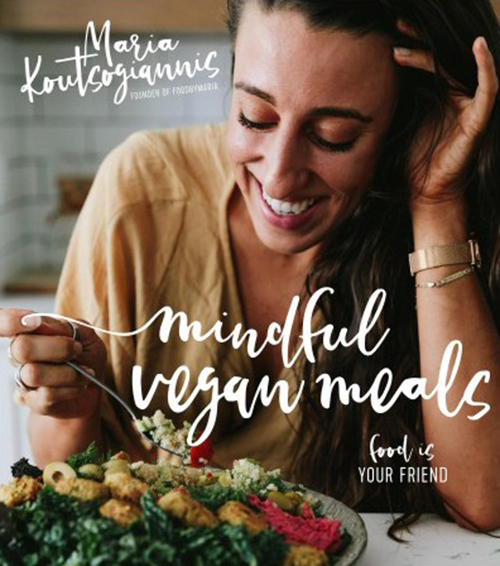 In Mindful Vegan Meals, Maria shares the story of her battle with bulimia and how she was able to overcome it with a plant-based lifestyle. She was once carb-phobic, but she now loves burgers, pizza, pasta, and sandwiches, and she shares her favorite recipes with us in this mouthwatering cookbook. The vibrant recipes in Mindful Vegan Meals are packed with nutrients, but they don’t lack in flavor. You’ll find recipes for such delicious dishes as Roasted Red Pepper Rigatoni Cake (yes, rigatoni cake, you read that correctly! 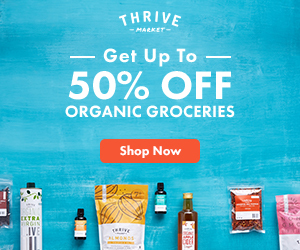 ), A Taste of Thanksgiving Meatballs, Confident Kick Black Bean & Sweet Potato Breakfast Burrito, and Ultimate Gooey Energy Bites. 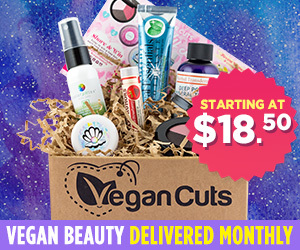 She’s also included recipe for do-it-yourself vegan pantry essentials, such as Vegan Parmesan Cheese, Butternut No-Cheese Sauce, and Creamy Roasted Cashew Nut Butter. Because breakfast is my favorite meal of the day and green is my favorite color, I’m sharing Maria’s recipe for Green Waffles with Creamy Corn Salsa with you today! This breakfast is for all my savory lovers. When I was recovering from bulimia it was really hard to even think about eating a heavy breakfast, let alone waffles. This recipe is really important to me because I realized eating waffles does not have to be bad for you. 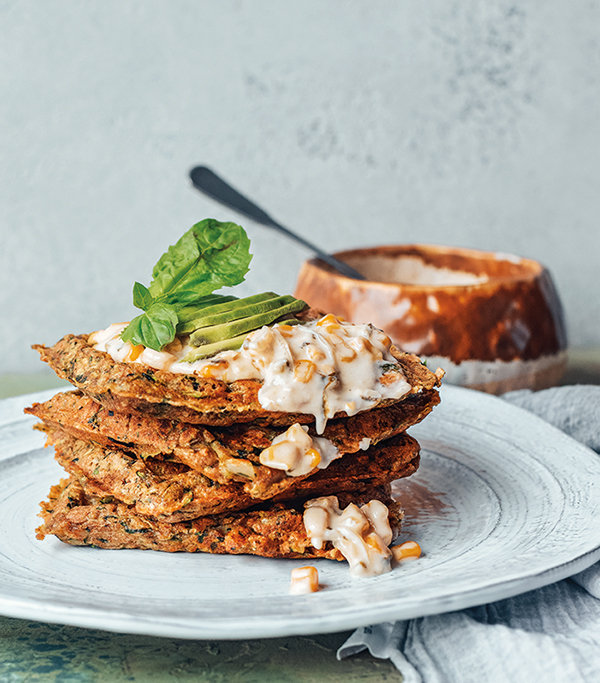 Instead you can take zucchini and spelt flour and make a beautiful meal to start your day! 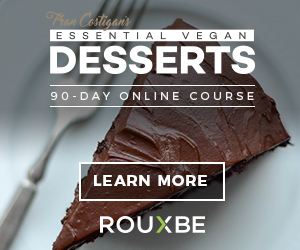 Add the ground flaxseed and water to a small ramekin. Give it a little stir and let it sit for about 10 minutes. Add the zucchini, onion, garlic, cilantro, olive oil, salt and pepper, spelt flour, oats, baking powder and almond milk to a large mixing bowl and stir until well-combined. (Start with ¼ cup [60 ml] almond milk and add up to ½ cup [120 ml] to reach a really moist-on-the-inside waffle, adding 1 tablespoon [15ml] at a time.) Fold in the flaxseed mixture then stir one last time, making sure there are no lumps. Heat your waffle maker; when hot, spray with coconut oil. Use a ladle to spoon the waffle batter onto the waffle maker and cook for about 5 minutes or until golden brown. Repeat this process, including spraying with coconut oil, with the rest of the batter. Keep the waffles warm on a plate or baking sheet in the oven set on very low heat while the rest of them cook and you prepare the corn sauce. While the waffles are cooking, make the corn sauce. In a medium-sized pan or skillet, heat the olive oil for 30 seconds. Add the onion and cook down on medium heat until translucent. Add your garlic and corn and cook over medium to low heat for about 10 minutes, or until the corn is soft and tender. Add the salt and pepper, jalapeño, cilantro and basil and cook for another 10 minutes on low. Add the coconut milk and cook for another few minutes or until hot throughout. Dollop the warm corn sauce onto your waffles and thank me later! It is believed that spelt flour was first used about 8,000 years ago, making it one of the oldest cultivated crops in human history! With a nutty and slightly sweet flavor, spelt is a grain related closely to wheat but containing less gluten and more protein. Recipe reprinted from Mindful Vegan Meals by Maria Koutsogiannis with permission.